Cam Newton likes to run. A season ago, the Philadelphia Eagles beat the Carolina Panthers in a very entertaining Thursday night game on the road on a short week. This year, coming off of a Thursday night game, the Eagles will have a few extra days to prepare for this team. In that Titans game, while Marcus Mariota had 10 rushes for "only" 46 yards, he had a key 17-yard run on 3rd and 19 in overtime, which led to a manageable 4th and 2 that the Titans converted. He also ran for a 2-yard touchdown in that game. The Panthers are a team that loves to run with their quarterback, which isn't necessarily a great idea for the long-term health of Cam Newton, but in the short term puts a strain on opposing defenses. As noted in the chart above, Newton had a good day running the football against the Eagles last season, when he ran for 71 yards and a touchdown on 11 carries. 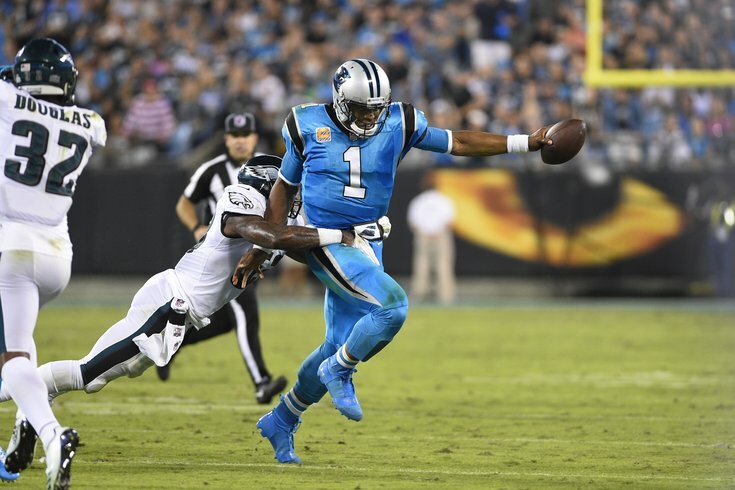 "Cam Newton has opened up every design run that you can imagine, and they've really ramped up their designed quarterback runs this year over anything they have done in the past," said Jim Schwartz on Monday. "There's a lot of teams that will run zone read stuff in the red zone or on a short yardage play. But Carolina, I don't think you can put any kind of constraint on down and distance. Third-down and whatever, you still got to handle the quarterback's designed runs, second-and-20, I think last night they had second-and-17 or second-and-20, and they ran the quarterback. There's a lot of other teams you can take him off your radar in those situations; not in this game. Every time that ball is snapped, whether it's designed run or just an off-schedule scramble, we're going to have to account for him." While McCaffrey has catches in bulk, his long reception on the season is a measly 18 yards. The Eagles won't mind if the Panthers dink and dunk all day. Eventually, they'll create a tackle for loss, a sack, or a penalty that will put teams like that behind the sticks, creating 3rd and long situations. But, they need to tackle better than they have the last few games, and McCaffrey is a slippery runner. The Eagles' struggles to stop the deep ball have been well-documented beaten to death by now, but it remains a problem. Luckily for them, the Panthers have been unable to create big plays in the passing game. So far this season, the Panthers have one pass play of over 40 yards, which is tied for worst in the NFL. That one 40-plus yard pass was a catch and run by rookie D.J. Moore. In other words, they haven't have the bomb shots that have plagued the Birds this year. Of course, the Eagles faced another team this season in the Titans that failed to hit on shot plays, and they went buck wild on the Eagles. They cannot let that happen again. The Panthers are banged up on their offensive line, as they are missing both of their starting offensive tackles, LT Matt Kalil and RT Daryl Williams. Their replacements have been Chris Clark at LT, and Taylor Moton at RT. Clark was unemployed Week 1 of the regular season, while Moton had never started an NFL game. Both Clark and Moton have exceeded expectations, particularly Moton, but this is a group that the Eagles' deep and talented defensive line has to exploit. In his press conference on Monday, Mike Groh was asked what stood out about the Panthers' defense. He pointed out their size up front. "Big, strong, physical defense," he said. "Up front, very hard to move. They're big, hard to run against. Luke Kuechly, it's a chess match with him on every down in terms of his ability to read and react and understand what the offense is trying to do to him and attack their defense. We know we got our work cut out for us. Excellent scheme, very good players, we know it will be a challenge this week." I was curious about Groh's comments, and it turns out that the Panthers' defensive linemen with at least 100 snaps played this season -- a group that includes Mario Addison, Kawann Short, Dontari Poe, Wes Horton, Julius Peppers, Kyle Love, and Victor Butler -- averages 298 pounds per man. That is indeed a big group, however, they are not impervious to the run. On the season, they are allowing 4.6 yards per rush, which is 23rd in the league. The Eagles are depleted at running back, but they would love to get early points on the board and get the run game going.